The School is up to what level? The School is from Nursery to Class XII. What is the area of the School ? The School is spread over about 40 acres of land. How to reach the school? The school is situated on National Highway No. 89 (Jaipur-Bikaner). 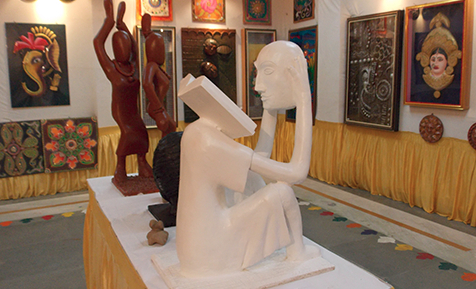 It is adjacent to Mahrishi Dayanand Saraswati (MDS) University at Jaipur Road, Ajmer. It is at a distance of 8 Km. from Ajmer Bus-stand and 10 Km from Railway Station. Public transport is easily available to reach the school. Ajmer is situated on main Delhi – Ahmedabad route of Indian Railways and direct trains are available to all parts of the country. The nearest Airport is Jaipur, which is just 1.5 hour drive connected through 6 lane express highway. Yes, the School is Co-educational. In What Way Is Sanskriti Different From Other Schools? The school provides burden of less education with a Day Boarding/ Boarding concept that does away with carrying heavy bags everyday. Each Class on an average has 30 students, thus providing individual attention to the students. What do you mean by 1:14 Teacher Student ratio and how does it help theScholars? The strength of each level is 30 having one level Mentor and other subject /activity mentors on an average of one per level, as such there is one Mentor for every 14 Scholars. As a result of this the Mentors can guide and motivate the Scholars in a more effective and personal manner. In what way will the activities of the school help the Scholars to grow? We do not believe in the concept of “Chalk and Talk”. Exposure to different activities makes the Scholars creative, independent, self-reliant and confident. They are better prepared to be good citizens and useful members of the society. Where do you lay more emphasis i.e. on Academics or Games? For holistic development of the child, a fine balance between the two is maintained and strictly adhered to. Academics are given foremost importance but at the same time Scholars have to participate in a game of their choice and the rich e-library opens many doors of learning to them. What is the medium of instructions? The medium of instructions is English. 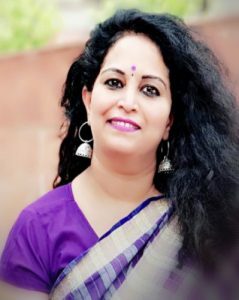 Is the School only for Hindus? The School has students coming from various religions like Muslims, Hindus, Sikhs, Buddhists and Christians. All the students are encouraged to practice their own religion in their own way. To which board the school is affiliated? All the teaching staff is qualified as per the CBSE norms. We aim to ensure that all students achieve examination results which are better, and relative to their abilities. We have produced 100% results in the CBSE Board examinations with a large number of merits and distinctions holders. What streams do you have in Class XI and XII? The School offers Science, Commerce and Humanities streams in Class XI and XII. How does the Computer Aided Teaching help the Scholars? Computer Aided Teaching gives an insight of a topic through graphics which leaves a lasting impression over the young minds. How the teaching techniques of your School are different from other Schools? The School believes in teaching through interactive methods instead of book teaching. Work Sheets are prepared on subject matter and solved by the Scholars by their own inputs. The basic purpose is to make Scholars understand the subject and frame own questions /answers instead of cramming from text books. How activities of SUPW are going to help Scholars? Our SUPW activities include environment development, weather reporting, First Aid, Rural Development etc. On these our Scholars can build a career, which could be very rewarding and satisfying. Do you provide extra coaching to weak students? Do you provide any type of specialized coaching to the students? The school has tie up with the best faculty, who provides specialized coaching for NTSE, Science Olympiad, IIT-JEE preparation, etc. The faculty provides coaching in the school itself. The students have an option to benefit themselves from it on payment basis. Yes, we have well equipped computer labs including language lab and we start computer teaching from Class I itself. How do I get admission in Sanskriti? Parents desiring to admit their students in Sanskriti have to obtain Admission form from the school office. Admission form can also be downloaded from the school website. Admission form duly filled in will have to be submitted to the school office along with the registration fees. After registration, the ward is called for an admission test in English, Hindi and Math. The student has to score minimum 50% in each subject to qualify for admission. No admission test is conducted for admission in lower school. What is the pattern/syllabus of admission test? Admission Test is conducted on the basis of syllabus of previous class studied. For example, for a student seeking admission in Class VI, test will be based on the course of Class V. Sample papers, if required, can be obtained from the school office. Do you register Scholars for admission for future years? Yes, Registration is open for future years. My ward is studying in Class III and I got registration for Class IV for coming session. Since your session begins in April, does my ward have to appear for examination of Class III in the present school? No, if your ward gets admission in Class IV of our School after passing entrance examination and fulfilling other formalities, he/she has not to appear for examination of class III of the present School. The same system applies to other classes also. Do you admit students from India only? No, admission at Sanskriti is open to students from India and outside India as well. At present, we already have students from Nepal and Tibet in the school. Special care is taken to ensure that International students settle down in the new culture. 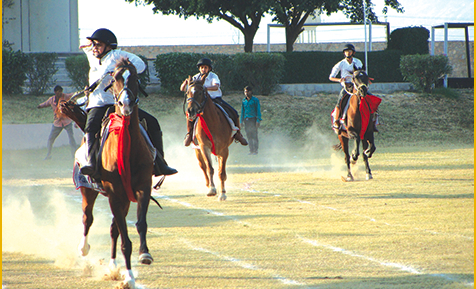 The School provides facilities for Horse Riding, Lawn Tennis, Cricket, Hockey, Football, Volleyball, Basketball, Badminton, Table Tennis, Squash, Athletics, 10 M Air Pistol & Rifle Shooting, Indoor Swimming, Softball, Wushu Academy etc. What are the other extra-curricular activities that take place in the School? The following are some of the other activities:- a) Sports, Games and Yoga b) Music, Art, Dance and Drama. Do the students take part in tournaments/activities? Yes, Inter-House tournaments/activities are held in the School in all disciplines and all the students are encouraged to take part. In addition the School holds inter School tournaments/cultural competitions and also send the children to other Schools to participate. 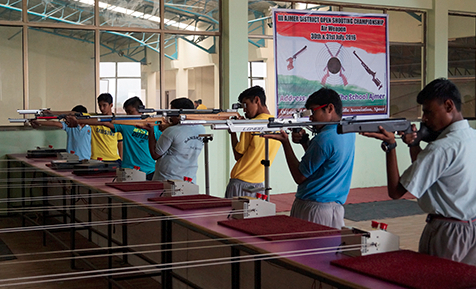 Our scholars also participate in District Level, State Level and National Level competitions. What sort of Discipline is maintained in the School? Strict discipline is the norm. The students are not left free and they are engaged in some activity or the other throughout the day. Is there Corporal punishment in the School? No, there are strict instructions to the teachers for not giving corporal punishment to the children. Counseling is encouraged. What facilities you have in your hostels ? The hostels are centrally air-conditioned. There is a separate study area for boarders of each group. Both boarding houses have comfortable Common rooms where spare time in the evening can be spent playing Table tennis, scrabble, chess, listening to music, watching a video or television or browsing through newspapers and periodicals. Do you have separate hostels for boys & girls ? Yes, we do have separate hostels for boys & girls. No, there are no separate rooms for every scholar. The shared rooms are spacious, with attached toilets, which can accommodate 3-10 scholars. Yes, seasonal fruits and milk are provided every day. All meals have green vegetables and pulses. Sweet dish is provided daily during dinner. How frequently parents can meet or call their wards? The school has its Hostel Rules and the parents can call or meet their wards as per schedule. Copy of hostel rules can be obtained from the school. Call/meeting other than the schedule can be done only with prior permission from the Principal. Do you allow children to call their parents on phone? The children are not allowed to call their parents. Is there any other mode of communication? The students are allowed to send emails under supervision and letter writing is compulsory once a fortnight. What is the security arrangement in the girls’ hostel? Girls’ hostel has a lady warden who takes care of the girls and their security. Girls cannot leave the hostel premises without permission of the warden. Boys are not allowed to enter the girls’ hostel. No male guest can enter the girl’s room. Do you have arrangements for stay of parents at campus? No, we do not allow parents to stay on campus, as it disrupts the scholar’s schedule. Do you take students out for tours, treks etc.? Yes, the children are taken on an educational tour (optional)of 5-7 days every year. In addition they are taken on regular educational outings to nearby places. What medical care, do you have for students? The school has an infirmary backed by a qualified Nurse. Doctor is always available on a call and we also have a tie-up with the best hospital of the city to take special care, if required. How often do you inform the progress of the ward to the parents? Progress of the day scholar is informed in Parent – Teacher Dialogue held at frequent intervals at School. Parents of hostellers are sent detailed report about their ward at the end of each term. However, any enquiry of the parents about the ward is promptly responded to. Parents can meet the Mentors/Principal with prior appointment. Do you provide vegetarian food only? Yes, we provide vegetarian food only. What sports facility do you provide to individual scholar? 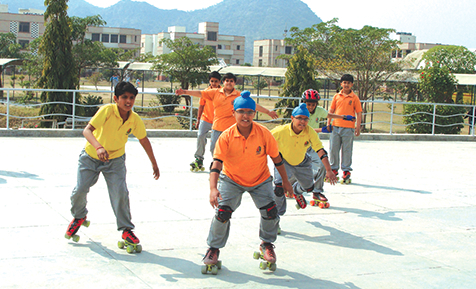 The school provides all sport facilities to the scholars. A scholar can excel himself in the sport of his interest for which specialized coaches are available. Do you provide any rebate in fee to the siblings? Yes, we provide a rebate of 10% in tuition fee to the subsequent sibling of the already admitted student. Is there any scholarship available to the scholars? a) Scholar who has secured more than 90% marks in Class VIII is given a scholarship of 25% of tuition fees of Class IX. b) Scholar securing more than 90% marks in both Class VIII & IX is given a scholarship of 50% of tuition fees of Class X.
c) Scholar securing more than 90% marks in all the Classes VIII, IX & X is given a scholarship of 100% of tuition fees of Classes XI & XII.